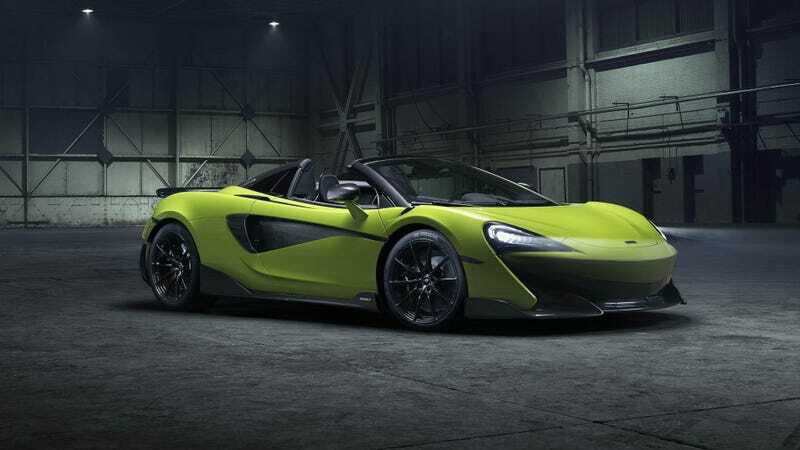 Thanks to an incredibly stiff carbon fiber chassis and some ridiculous performance figures, the new McLaren 600LT Spider maintains all of the amazing performance of the fixed roof car, but now with the option to show a little more face when cruising down the avenues. The 600LT convertible keeps the 592 horsepower 3.8-liter twin-turbo V8, a dry weight under 1,300 kg (or about 2,866 pounds), the stiff carbon monocell chassis that required no other strengthening, and top-exit exhausts, but adds a folding hardtop roof and just slightly more compromise over the regular 600LT. McLaren even managed to keep most of the performance figures the same, matching the coupe’s 0 to 62 mph time of 2.9 seconds and only taking a 0.2 second penalty in the acceleration time to 124 mph, which is now 8.4 seconds. With the roof up, its top speed is 201 mph, which only drops to 197 mph if you drop the top. The convertible is still about 110 pounds heavier than the regular coupe for the folding hardtop bits, and even then you only maintain McLaren’s claim of keeping weight under 1,300 kg if you pay for the carbon fiber seats out of the Senna, option the titanium wheel nuts, get the rest of the carbon options in the MSO Clubsport Pack and don’t go with any audio or air conditioning features. The MSO Clubsport Pack costs around $23,400 on its own, so it might be time to run down to the Coinstar machine. The 600LT convertible starts at $259,000 and sits as the fifth model to earn the LT designation, which stands for Longtail, and joins the 600LT coupe, the 675LT and 675LT Spider, all of which are named after the iconic McLaren F1 GTR Longtail.